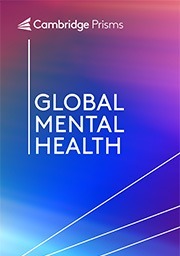 Global Mental Health (GMH) is a fully Open Access journal that publishes papers that have a broad application of ‘the global point of view’ of mental health issues. The field of ‘global mental health’ is still emerging, reflecting a movement of advocacy and associated research driven by an agenda to remedy longstanding treatment gaps and disparities in care, access, and capacity. But these efforts and goals are also driving a potential reframing of knowledge in powerful ways, and positioning a new disciplinary approach to mental health. GMH seeks to cultivate and grow this emerging distinct discipline of ‘global mental health’, and the new knowledge and paradigms that should come from it.GMH invites contributions from a range of disciplines, stakeholders, and research methods in order to achieve its aim. The Editors reflect this diversity, with expertise in areas outside of the traditional ‘mental health’ silos that must be included in order to make global mental health truly ‘global’ in nature.